In the Movie or TV, actors run or fly through elaborate and exotic landscapes or they ride on dragons backs or visit magical realms with towering citadels inhabited by fantastic creatures that don’t exist in the real world. Sometimes the story takes place in a native city, but in the distant past or the far-off future. Sometimes characters stage epic fights that seem to pulverise landmarks or places that audiences know well or where they live. And sometimes, the person is physically transformed or defy the laws of gravity. This all things are only possible using Chroma keying technique which quickly and easily removes the green screen and panel from the people standing in front of them and replaces the backgrounds with pretty much anything. Shooting green screen footage is a simple and easy process that allows you to make promotional videos more interactive and visually appealing. 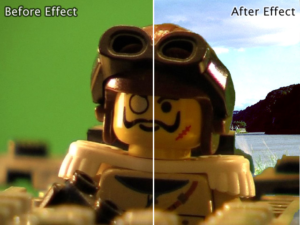 Before you can add special effects, titles and transitions, the green screen should be removed appropriately. 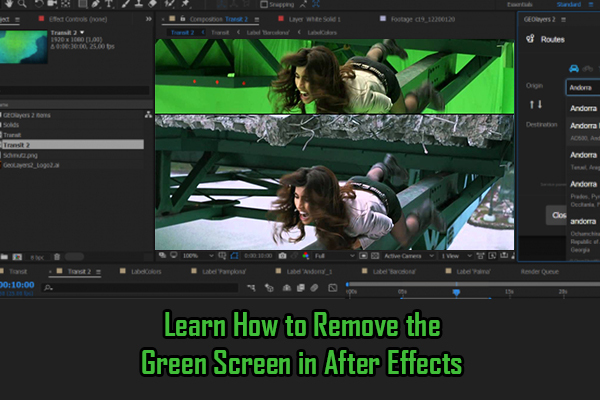 Adobe After Effects has the perfect tools to clean up any noise and easily remove the green screen. Two built-in tools can be used to remove the green screen for your project and present a professional looking video. 1. Click on the green screen video footage to make it working in Adobe After Effects. 2. Click on “Keying” “Keylight” and “Effect.” This is a plug-in effect for After Effects that automatically comes with software. 4. Select on “Eyedropper” icon next to the Screen Color option. Click on a section of the green screen towards the middle of a video. 5. Click on “View” and select the “Status.” Here you see any parts of the green screen that were not removed. These areas will look white and grey around the object. 6. Increase the Screen Grain till the outer edges of grey and white disappear, and you see only the shape of the object. 7. Play the video to see the green screen removed. 1. Click on the video layer to initiate it. 3. Click on the Effect Controls tab in the left of the software. Scroll down and find the Color Key Effect. 4. Click on eyedropper tool next to the color option. Click on green screen in the Composition Window. Most of the green will disappear. 5. Move the Color Tolerance slider and adjust or modify to remove similar shades of green or darker areas that were cast from lighting and shadows. 6. Adjust the Edge Feather option so the objects in front of the green screen will combine into the background without rough or glowing edges. 7. Play a preview of the video to assure that the green screen does not appear throughout the whole timeline. Adjust the Edge Feather and Color Tolerance as required.